Join your fellow Sprockets to find out how Seventh Sense can give you email insights you’ve never seen before. You’ll discover how to get more success out of your email campaigns by getting emails in front of marketing and sales prospects at the opportune time—when they’re looking at their inbox. If you’re craving more now? Check out this handy infographic that reveals when your leads will unsubscribe from your emails. Bonus! Attendees of the HUG event, both in Philly and Ann Arbor, will get a surprise exclusive offer. Only available if you attend in person. 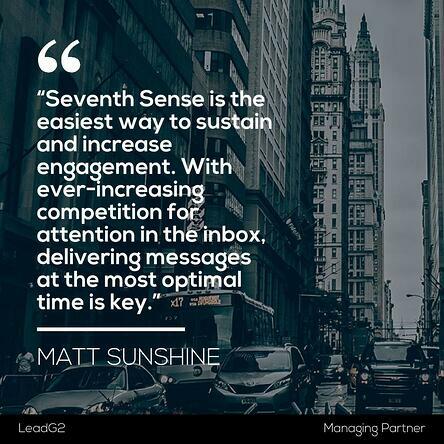 Mike Donnelly is the CEO and Founder of Seventh Sense. As a recognized sales leader in the technology industry, Mike has used the culmination of more than 13 years of experience building and managing territories to bring to market a revolutionary way of analyzing, visualizing and making data actionable for sales and marketing professionals.